Code Inside Blog | There is a new GAC with .NET 4.0? There is a new GAC with .NET 4.0? Every .NET 4.0 or CLR 4.0 application use this GAC. What happens to the „old“ GAC? It is still responsible for .NET 2.0 - .NET 3.5 or CLR 2.0 applications. CLR? .NET Framework Version? Isn’t that the same thing? “In .NET Framework 4.0, the GAC went through a few changes. The GAC was split into two, one for each CLR. The CLR version used for both .NET Framework 2.0 and .NET Framework 3.5 is CLR 2.0. There was no need in the previous two framework releases to split GAC. The problem of breaking older applications in Net Framework 4.0. Thanks for the post. “Interference issues” was intentionally vague. At the time of writing, the issues were still being investigated, but it was clear there were several broken scenarios. 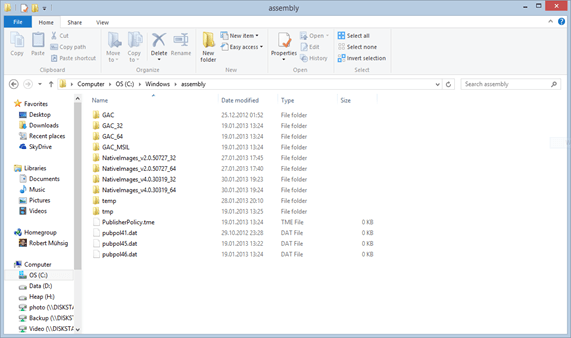 For instance, some applications use Assemby.LoadWithPartialName to load the highest version of an assembly. If the highest version was compiled with v4, then a v2 (3.0 or 3.5) app could not load it, and the app would crash, even if there were a version that would have worked. Originally, we partitioned the GAC under it’s original location, but that caused some problems with windows upgrade scenarios. Both of these involved code that had already shipped, so we moved our (version-partitioned GAC to another place. This shouldn’t have any impact to most applications, and doesn’t add any maintenance burden. Both locations should only be accessed or modified using the native GAC APIs, which deal with the partitioning as expected. The places where this does surface are through APIs that expose the paths of the GAC such as GetCachePath, or examining the path of mscorlib loaded into managed code.